When we praise Facebook for its interface being lot better than other Social networks like Orkut, Hi5 etc. then why the hell do they want to become like Twitter? Its a social network and we don’t want to make it a micro-blogging site. I had waited for few days until Facebook finally gave me too a chance to check it out, and i finally checked what it is. Facebook Lite – The new version that is being tested by Facebook after they have already tried a lot of facelifts to make it look better to navigate. But most of the changes suggest it to look more like a micro-blogging site just like twitter, friendfeed etc. which is just a bad decision if the change goes for real. We are currently testing a simplified alternative to Facebook.com that loads a specific set of features quickly and efficiently. Similar to the Facebook experience you get on your mobile phones, Facebook “Lite” is a fast-loading, simplified version of Facebook that enables people to make comments, accept Friend requests, write on people’s Walls, and look at photos and Status updates. We are currently testing Facebook Lite in countries where we are seeing lots of new users coming to Facebook for the first time and are looking to start off with a more simple experience. This evening, the test was temporarily exposed to a larger set of users by mistake. We have not opened up access to lite.facebook.com to all users at this time. People who are not part of the test and are trying to access “Lite” will be directed to Facebook.com as usual. Its too simple, with everything clearly visible easily in the profile pages, but a Friendfeed user won’t see much change. 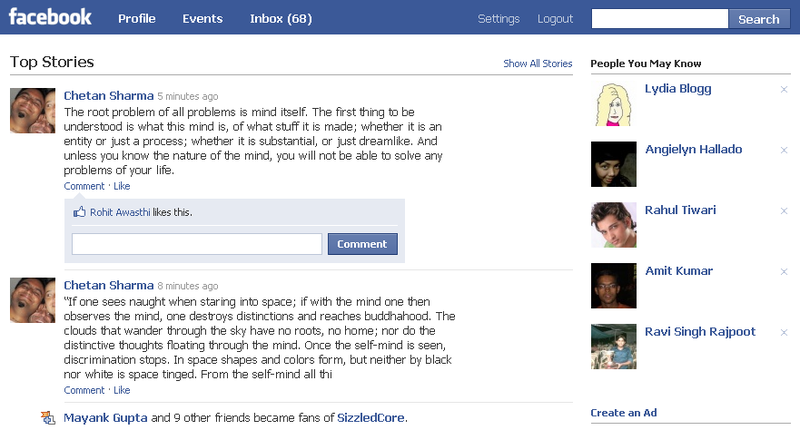 This lite version of facebook came out after the deal between facebook and friendfeed had occurred. So, was it something related to it? Lets see, as of now my review is not much to speak about it, but what Facebook has planned with take it somewhere unexpected, and people won’t like it. i agree…its not a wise change..but i did that by mistake and now want the old facebook back. can u please help to do that. i switched to facebook lite by mistake….bt now i want to go back to the old facebook.plz help me immedaitely…. So then i made a wise decision made by me. but thanks for your post and the suggestion. I think apart from fast loading it seems to be very user friendly and the new enhancements are not so good. better to use the old one.